Black and silver KUPPET 2-in-1 is a portable and multifunctional, countertop style ice maker and water dispenser in one commercial grade stainless steel unit, with a 33 pounds of ice making capacity per day. Your bullet shaped ice cubes will be ready in just 7 to 15 minutes. Kuppet Ice Maker has an ice storage capacity of 2.6 pounds and comes with an ice scoop that will make your life easy each time you remove the ice. It offers high productivity with an efficient compressor and can work non-stop for 24 hours without interruption. You will not need to ever get ice from the stores. 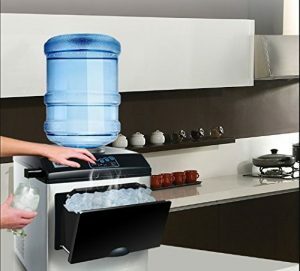 It will deliver ice or cold water to drink conveniently and whenever you want just like a water cooler delivers water. 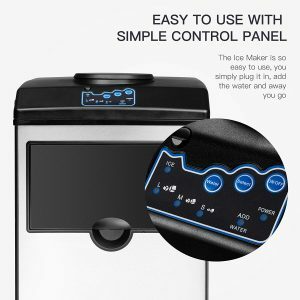 You can actually choose the ice size of small, medium or large through the simple to use display panel that also has the On/Off, Select, Water buttons as well as the Ice, Add Water and Power indicator lights. You’ll know when you need to add more water or when your ice is ready to use. It is a very easy to use plug and play type of unit that you just switch on, pour some water in and let it run. The good quality compressor (110-120V/60Hz) is very efficient and runs very quietly, making very little noise and you’ll hardly hear anything. As an ETL certified product it comes with some built-in security features like the auto overflow protection, auto power-off when there is no water or ice bin is full and is perfectly safe to use. It works with both the 3 and 5 gallon water bottles that you can buy from different supermarkets. It has a water spout that can be extended, you can hide the water outlet when you don’t need to get water or press it when you want to get some water. You can either add water manually after pulling out the ice basket or by using a 3 or 5 gallon water bottle. The ice it makes is quite hard and doesn’t melt easily. Black and silver Kuppet 2-in-1 weighs 37.5 pounds and measures 14.1 x 16.7 x 17.8 inches. You can use it in your kitchen, patio, office, dorm room, boat or RV, in parties and gatherings thanks to its compact and portable design. In the box you’ll find the ice maker/water dispenser, an ice basket, an ice scoop and a user manual. It has an exhaust vent and the fan will run only when it is cooling the water and rest in other times. Please note that the basin on the unit is not very deep and you’re better off using the bottles smaller than 5 gallons if you don’t want to spill water or act quickly. You can turn on or off the hot or cold water through the back if you want to prevent any accidents by your kids. The water dispenser runs a little slowly as it is not really this machine’s primary function. It will need to reheat or recool after delivering a couple of glasses of cold or hot water. But it does cool or heat very quickly and the water it offers is very hot and very cold. You really can’t go wrong at the current low price level, especially if you’ll be using it in small places.